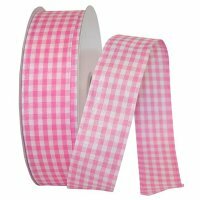 This Pink Gingham Check Ribbon is the perfect choice for so many projects with our Check Ribbon is a perfect choice! The Ribbon Diva's Check Ribbons are available in various colors and sizes. With a wide range of uses, our check ribbons are used throughout the gift floral, craft and packaging industries. This Check Ribbon is ideal for gift packaging, bows for baskets, floral arrangements and much more.